The act creating the new Canadian province of Newfoundland (now Newfoundland and Labrador) came into force just before midnight on March 31, 1949, ceremonies marking the occasion did not take place until April 1. The British Parliament passed the necessary legislation on 23 March, and the Terms of Union came into effect “immediately before the expiration of the thirty-first day of March 1949” (Term 50). In Newfoundland, official events were concentrated in St. John’s. There was a brief swearing-in ceremony at Government House for the new lieutenant-governor, Sir Albert Walsh, who then accepted a Canadian citizenship certificate on behalf of all Newfoundlanders. Those present at the ceremony listened to a broadcast of the ceremonies in Ottawa before attending a reception. Later in the day, Walsh swore in the first members of the interim government. Despite the fierce contest that had led to this point, the day passed very quietly, with little demonstration either for or against Confederation. “… This is a day which will live long in North American history. It is a day of fulfilment – fulfilment of a vision of great men who planned the nation of Canada more than eighty years ago …. I fancy we see them now, bending over this scene in silent and profound approval …. Thus we begin life as one people in an atmosphere of unity. We are all Canadians now …. Joseph R. Smallwood would become the first premier. 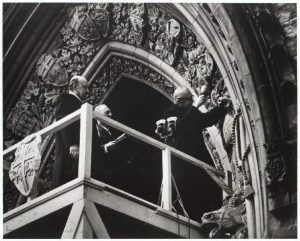 St. Laurent then made the first few cuts into a blank escutcheon that had been reserved for Newfoundland’s coat of arms since the reconstruction of the Centre Block after the fire of 1916. After a speech from the Governor General, events concluded with the singing of “God Save the King,” “Ode to Newfoundland,” and “O Canada.” As events were broadcast via radio, people from Newfoundland were able to listen in. Recommended Archival Collection: At The Rooms Provincial Archives Division explore GN 154 a collection that consists of minutes of the delegations 41 meetings in St. John’s; letters to the Chairman and the Secretary of the Newfoundland Delegation to Ottawa from societies, business firms, Labour unions, etc. regarding the effect of Confederation on various organizations. Recommended Exhibit: Here, We Made a Home. The Elinor Gill Ratcliffe Gallery – Level 4. The Rooms. Come over to the Rooms and find Joey Smallwood’s glasses and bowtie. Did you know that the Newfoundland and Labrador official version of – The Terms of Union with Canada are held in The Rooms. This entry was posted in Archival Moments and tagged April 1, Confederation, Gordon Bradley, Joey Smallwood, Ode to Newfoundland, Parliament Hill, Sqid Jiggin Ground, St. Laurent on April 1, 2019 by Larry Dohey.